Our Toronto and Montreal facilities together provide us with the ability to warehouse more than 200,000 square feet of customer product. This enables us to maintain stock based on customers’ forecasts and react to the changing demands of the marketplace. 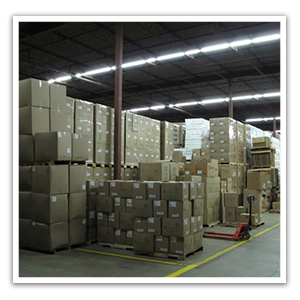 Our expertise in efficient warehousing allows us to capitalize on large run sizes and provide extremely competitive pricing to our customers. Our capacity also allows us to offer a diverse and sizeable selection of products for sale through our distribution office as well as our ‘cash and carry’ locations.